“Roof replacement” is one the most dreaded phrases in the English language for commercial building owners. Anyone who has experienced a commercial roof replacement (and afterwards received the bill for it) knows just how expensive, stressful, time-consuming and business-disrupting it is. Many a business owner has wished there was a less expensive alternative to replacing a roof; and many business owners don’t know that there is a less costly—but incredibly effective—alternative: roof coating! Very often, a roof coating system costs less than the insurance deductible for a roof replacement, which is one reason many building owners end up gravitating toward this incredible solution. For those whose roof damage isn’t covered by insurance or warranty, the comparative savings are even greater. But lower cost is just the beginning when it comes to the benefits of a roof coating system! Read on to learn more about roof coatings and how they can restore your roof, or call E&E Construction Company at (740) 331-0695 for additional details and to schedule a consultation. 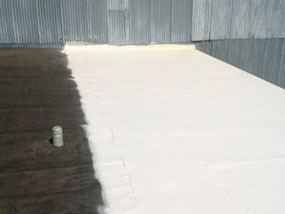 A roof coating is a fully adhered, seamless membrane that is applied right over top of an existing roof. Many older roofs are great candidates for a roof coating system, and the benefits of this innovative solution are incredible. 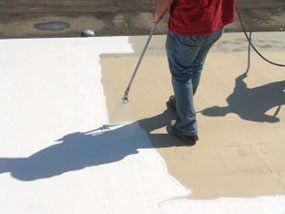 For starters, the installation process for a roof coating is only minimally disruptive, whereas a full roof tear-off and replacement is hugely labor-intensive and business-disrupting and can cost a business substantially in terms of time lost. Roof coatings are also able to fix all of a roof’s problems and restore it to like-new condition, significantly extending its functional life and delaying the need for replacement by years. What’s more, a coated roof can be re-coated down the road, which delays the need for roof replacement indefinitely. To learn more about the outstanding roofing solution that is a roof coating, give E&E Construction Company a call today at (740) 331-0695. We will send one of our expert technicians to your location, at no cost or obligation to you, to inspect your roof and determine if it is a good candidate for a roof coating.